International friendly: Ghana 1 Angola 1 Scorers: Ghana - Ablade Morgan 90 Angola - Fofana 55 Ghana's Black Stars, dominated by home-based players, relived the fighting spirit of old to turn an almost hopeless situation around against the Palancas Negras of Angola at the Accra Stadium last Wednesday evening, thus confirming the commitment of the current generation of players to the nation's World Cup dream. 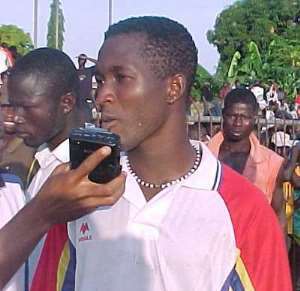 Trailing the Angolans 1-0 in that international friendly, the ill-prepared Stars team turned the heat on the visitors in the last quarter of the game in search of the much-needed equaliser which eventually came in injury time through substitute Ablade Morgan just before FIFA referee Alex Kotey's final whistle. Though the local fans had anticipated victory in last Wednesday's match, the draw can only be described as impressive in the circumstance especially considering the fact that the Stars had barely two days to prepare for the match as against Angola's long standing team. On the day, the Angolans paraded as many as nine AS Aviacao players to underline the kind of cohesion the team enjoys. No wonder, they managed to give the Stars some anxious moments throughout the game. But that opposition was good enough to test the character of the new Stars squad which played minus most of the foreign-based players, notwithstanding the fact that the match was honoured on a FIFA free day for international friendlies. And to add to their woes, the Stars were rocked by injuries on Wednesday as players like Baffour Gyan, John Mensah, Anthony Obodai, Lawrence Adjei and first choice goalkeeper, Sammy Adjei, had to be substituted at various stages of the duel. It was as a result of these mishaps that head coach, Mariano Barreto, showered praises on his players after the match for fighting a good fight. The Stars had earlier begun their build-up to the 2006 World Cup qualifiers which kick off on June 6 against Burkina Faso, with a 1-1 away draw against French Division One side, Metz in France. They are billed to play Portugal in another friendly before confronting Burkina Faso in that crucial opening away game.